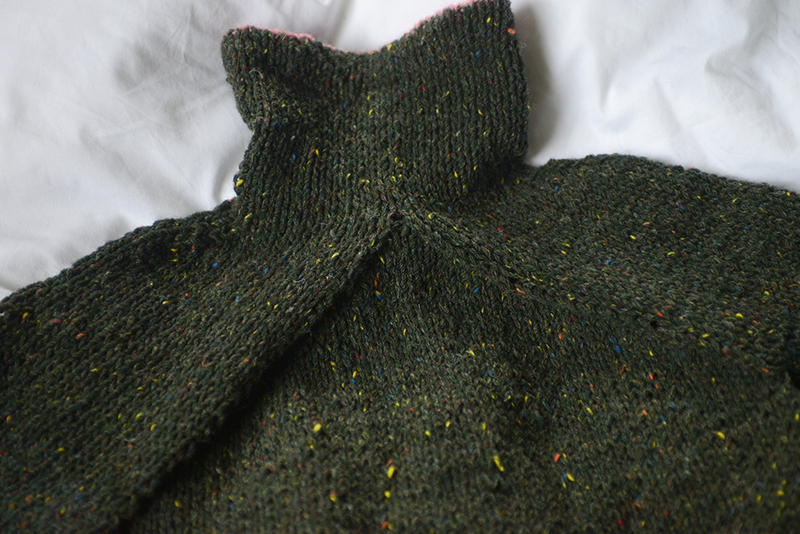 One of the things I made over this past winter, was this iconic wishbone sweater from Elizabeth Zimmerman's The Knitter's Almanac. Alternately called the 'December Sweater', and the 'Hurry Up! Last Minute Sweater,' this popular design knits up quickly and easily in a chunky wool and makes for a fun, satisfying project. Having long admired the unique look of this sweater's wishbone construction, I finally decided to knit one of my own. Only... instead of following dear Ms. Zimmermann's instructions, I did something completely different. Can you tell what it is? One more hint in this photo! Can you see what's happening here? Okay. So as fans of Elizabeth Zimmermann know, most of her designs - including this one - call for knitting seamlessly, in the round, from the bottom up. With this method, you first knit the sweater body as a tube, up to the sleeves, then each sleeve separately, and finally, you connect the 3 pieces and decrease up the yoke. My preferred method of seamless construction, however, is to knit top-down: To start at the neck, increase as I work my way down the yoke, leave the sleeve stitches on scrap yarn, continue down the body all the way to the hem, then finish by picking up the sleeve stitches and knitting each of those. As you have probably noticed by now, I knit the wishbone sweater using this latter method. As with most of my knits, I did it initially without thinking. It was really just an impulse. As I much prefer to knit top-down than bottom-up, I thought "why not! ", made myself a strong cup of tea, and cast on. To begin with, I estimated how many stitches I'd need for the neck, then simply reversed EZ's yoke-making instructions - increasing both at the 'wishbone' bits in the center of the front and back, and additionally at the tops of the shoulders, in place of where she indicates to decrease. The result, as you can see, looks identical, even though it was arrived at in the exact opposite manner from the original instructions. Naturally, I did not write any of this down. I did not see a point, as I wouldn't be making this sweater again. But after I posted a snapshot of my work-in-progress on instagram, a few people emailed me to ask whether I could make this available as a pattern. Turns out I am not the only EZ fan who prefers top-down knitting! So I had a think, retraced my steps, and wrote everything down. In the process I also realised that I made one other modification to the original Knitter's Almanac instructions: In the original, the author warns that the wishbone design only works with chunky wool. She has tried to vary the gauge, she writes, but ended up unraveling every time. As you've probably noticed in my pictures, I did not use chunky wool for my sweater (the yarn here is a Kerry aran, knitted on size 4 needles), yet it worked out perfectly fine. I did not realise this until I went back to write down my steps, but it seems that I unthinkingly made some modifications to make this possible. While I still remembered what they were, I made a note of them. It was only at this stage that I paused to think: "So I've written down the pattern. Now what?" Because suddenly it dawned on me, that I would probably need permission to share it. After all, the original design is copyrighted as part of The Knitter's Almanac. And an extensive online search makes it clear that knitters have been very careful not to share it - or any patterns derived from it - illegally, out of respect for the late author. I was not about to break that tradition. So I emailed Schoolhouse Press (which was founded by Elizabeth Zimmermann and today is run by her daughter and grandson). To my delight, I received a friendly reply. But unfortunately, the rights to The Knitter's Almanac and all its contents are not with them but with a certain Big Publisher. I would need to get in touch with that publisher directly. And this I did. Or at least, I tried. I won't go into the details for fear of putting you to sleep. But long story short, it has been over a month now and I have not received a clear reply from the Big Publisher. And until I do, I'm afraid I cannot (and the Schoolhouse Press confirms this) legally share my pattern. It's a ludicrous situation, but there it is! It would be one thing if my method involved a mod to the original instructions. In that case I could write, follow the pattern in The Knitter's Almanac, except do the following differently. This way, the reader would still need to own the original pattern to end up with the sweater. However, as my pattern essentially involves a complete rewrite and reversal (conversal?) of the original, there is no way to publish the modifications in isolation. 2. Unfortunately I cannot at this time share my pattern. I do hope the situation changes in future, and I will keep you updated on how this story turns out. I will also write a separate post showing the finished sweater (which ended up looking a little differently than what you see here) and talking a little bit about this nice Kerry wool. Stay tuned. And if anybody else out there has attempted to 'upturn' this sweater (surely I can't be the only one? ), I would love to see your results.